Prior to his arrest in November 2018 by Japanese authorities and his subsequent fall from grace, Ghosn headed the multinational three-company alliance between Renault, Nissan, and Mitsubishi Motors Corporation — the largest such automotive partnership on the globe — and served as either CEO or chairman (or both) of each individual firm since the formation of the alliance in 1999. On Nov. 19, 2018, Ghosn (as Nissan chairman), along with Nissan Representative Director Greg Kelly, was arrested by Japanese police on the suspicion that the two had conspired to consistently underreport Ghosn’s earnings. A hastily assembled press conference called by Nissan officials confirmed the arrest later the same day, revealed that the Japanese automaker had been conducting an internal misconduct investigation for several months prior, and also pledged Nissan’s continued cooperation with Japanese prosecutors. Nissan’s board of directors voted unanimously to sack Ghosn as chairman on Nov. 22; while Ghosn continued to deny any wrongdoing, Mitsubishi's board of directors followed Nissan and dismissed Ghosn as chairman on Nov. 26. While Renault kept Ghosn as chairman and CEO, with the French government urging Nissan to share evidence of Ghosn’s wrongdoings, Paris — Renault’s largest shareholder — ultimately instructed Renault to pick new management on Jan. 16, 2019. Ghosn formally resigned from his posts at Renault on Jan. 24 from a Tokyo jail cell. 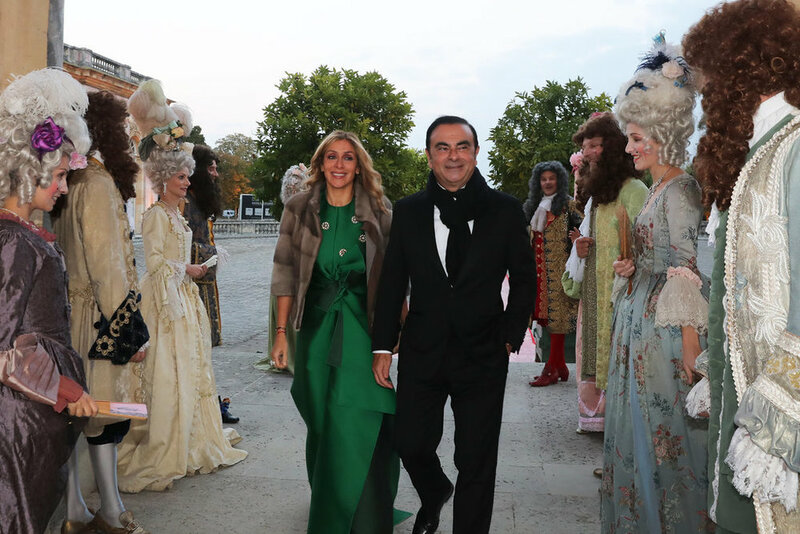 Carlos Ghosn and his wife at their 2016 wedding celebration at Versailles Palace, which came under scrutiny by Renault regarding Ghosn’s use of the company money for the party. The lengthy detention of Ghosn by prosecutors in Tokyo has drawn an international backlash from right advocacy groups against the Japanese judicial system while fueling growing diplomatic friction between the Japanese and French governments. Per standard practice under the Japanese Constitution and Code of Criminal Procedure, prosecutors are permitted to hold defendants if they pose a risk of tampering with evidence or escaping the country. Apart from the legally permitted three-week minimum detention time of suspects, Japanese prosecutors have access to questionably legal methods to extend the duration of detention and compel incriminating testimony, including interrogating suspects for extended durations of time without the presence of defense counsel and re-arresting suspects (even when already detained) on additional charges. Ghosn’s lawyers have appealed for bail on at least two separate occasions to no avail. According to reports, in an appeal, Ghosn offered to rent an apartment in Tokyo and pay for his ankle bracelet. While prosecutors at the Tokyo District Court declined to give their rationale for arguing against bail, the deputy district prosecutor did remark that Japanese courts did not use bracelets for defendants on bail. Since Ghosn was arrested, Western human rights organizations have amplified their criticism of the Japanese criminal justice system. Other court systems, such as the US justice system, regularly grant defendants bail with some specified bail amount. Yet, in the Japanese system, any defendant can be subject to an indefinite period of detention before any final court ruling if prosecutors find it necessary.